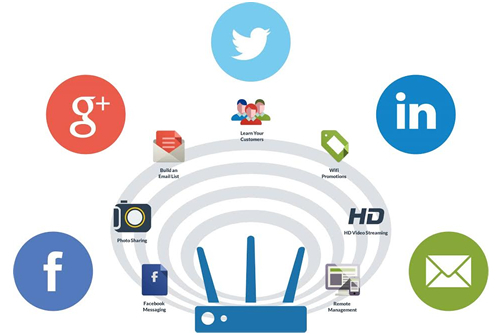 Smart Social WiFi is a modern analytics and marketing tool that allows owners of various establishments to identify and interact with their guests, for example by using real-time promotional campaigns, mailing, conducting surveys via star rating system and gathering feedback. Social WiFi allows hotels and restaurants to identify the client, analyze his experiences and improve the establishment so that it is visited more often, hence providing more profit. At the moment our whole team focuses primarily on technological progress of the service - introducing more facilitation's for the users, while developing the partnership program for resellers. best IT and Telephony solution provider in UAE -www.netsys-ae.com is the leading strategic IT partner for companies across India, the Middle East and Australia offering integrated IT solutions. We plan, deploy, sustain and maintain your IT lifecycle through our total outsourcing, consulting services, business solutions and professional services. NetSYS Consultants helps you drive momentum in your organization, no matter what domain you are in. Backed by our strong quality processes and rich experience managing global clients across various business verticals, we align IT strategies to your business goals. Along with our best of breed technology partners, NetSYS also helps you with your hardware and IT infrastructural needs. NO 1 - SMARTHR software cloud and onpremise porvider in GCC - www.smartcitysystems.com offers you a complete set of IT services including Internet sites and applications, hosting services, IT infrastructure, Smart Products, Software Development and Professional Support Service (PSS). SCS provides a customized solution for each of our clients. We see it as an important part of our service to understand our customer requirements and proactively meet their needs. Our foresight has contributed much to our success. We aim "Complete Customer Satisfaction". We are partnered with leading brands of surveillance solutions products to offer complete peace of mind with excellent service at a very affordable price.